Here’s to more quality local movies! 2018 proved to be one of the most outstanding years in Malaysian cinematic history. If there’s any word to describe it, it’d be 'healthy and wealthy'. That's because our made-in-Malaysia movies raked in a whopping RM150 million at the box office while breaking records and raising the bar for local films along the way. It’s definitely a year to be proud of no matter if you are the producer, the actor, a normal movie-goer, or a local movie fan. so it goes to show that no matter what type of film you produce, as long as it is something of quality, fans will definitely support it. If you’re wondering which movie in question that hit a homerun at the box office this year, we give you not one but six of the top performing local films of 2018. This movie attempted to narrate our national sports hero’s journey from a small-town kid to becoming the world’s number one badminton player. We got a glimpse into the life of Lee Chong Wei growing up before his days training with Misbun Sidek and how he struggled to earn his title. Read our review here. After more than a decade being ‘locked away’ from the public, Dukun finally made its way to the silver screen, quenching the thirst of Malaysian horror-thriller fans. It’s amazing that a movie produced 12 years ago was so well made and preserved that it remained relevant and creepy to this day. The film, inspired by Mona Fandey’s gruesome murder case, received rave reviews from fans and critics alike. You can read our spine-chilling review here. 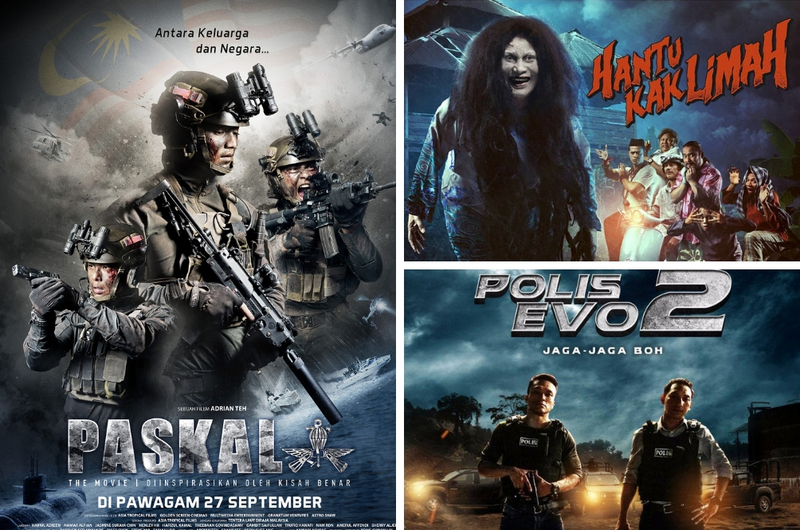 Directed by Syafiq Yusof, who comes from a family of great directors and producers, KL Special Force packed a punch during the first quarter of the year. The film tells the tale of a special police unit force (obviously) who goes up against the Anarchist Gang, a gang notoriously known for pulling off robbery and heists. Lots of action and explosions; something you’d expect from the Yusof family clan. If we had to pick the best movie of 2018, we’d be happy and proud to bestow the title onto PASKAL: The Movie. In an industry filled with horror and comedy films, this military-themed film was a breath of fresh air. Viewers were treated to a display of badass military national assets and military SOPs, as well as a behind-the-scenes look into the life of a PASKAL (Pasukan Khas Laut) member. You can read our review here. If there was a title for the queen of hantus in Malaysia, it should go to Hantu Kak Limah because she laughed her way to the bank as it became the highest grossing horror-comedy film this year. To know how she earned the spot, read our review here. The third installation of the Kak Limah universe raised the bar for the local entertainment industry when the movie became the first local film to breach the RM20 million and RM30 million mark at the box office, something which was never done before. Hantu Kak Limah ‘haunted’ the box office for a good amount of time but not until the ghosts from hell in Munafik 2 overruled her. Directed by Syamsul Yusof, the horror movie became the highest grossing movie of all time to date and also probably the movie that gave you the most sleepless nights (read: nightmares). Read our review here. Polis Evo 2 is one of the last local films to be released this year, and it has received glowing reviews from critics and fans. Releasing it at the end of the year is probably a wise decision because as they say, you got to save the best for last. After only 11 days at the cinema, the action-packed sequel managed to collect RM17 million at the box office. We foresee Polis Evo 2 doubling or maybe tripling the box office receipts in the weeks to come because it is that good. Read our review here. Polis Evo 2 is still screening in cinemas nationwide. And if you're all about supporting out local movies, you can also catch two other local films that are still showing in cinemas - Tujuh: Sumpahan Suri and Operasi X.